GRATEFUL DEAD BEAN BEAR BLUES MAN -3rd EDITION- MINT! Up for Sale is a Grateful Dead Bean Bear. Grateful Dead 7 Inch Plush Bear Great Beyond New Liquid Blue. Condition is New. Been in the box since I purchased it directly from Liquid Blue. Took it out of the box and took pictures of it. Never displayed or played with. From a smoke free and pet free home. Grateful Dead 14 Inch Plush Bear Friend O' Mine New Liquid Blue. Condition is New. Been in the box since I purchased it directly from Liquid Blue. Took it out of the box and took pictures of it. Never displayed or played with. From a smoke free and pet free home. Check out our other bears. There are 9 of these Tie Dye Bears and each one has unique colors. They played everything I wanted to hear that night - it was like they could read my mind! Lil Del is in solid pre owned condition. Displays well. No holes or tears. CHECK OUT THE PHOTO!Nice condition, pet and smoke free as always. Have had this in storage for years. Was issued in Fall of 1998 upon the release of the cloth & plush Jerry Garcia doll. Nice graphics. Grateful Dead Grateful Bear dated 1990. Dressed as a pilot with a hat and scarf. He is in excellent condition with the only flaw being on the bottom of his scarf, please see picture. Hinged arms and legs ,made by Steven Smith stuffed animals INC..Approximately 12" in length. Check out our other bears. The Deal to close the first set was THE BEST! Series A was released in June 2001. It is in excellent condition. Never displayed or played with. We used to be a distributor for these bears.It was only taken out to take photos of it. 2001 LIL GRATEFUL DEAD BEAN BEAR CUB. We want you to be happy and are very reasonable in making things right. Grateful Dead Liquid Blue TENNESSEE JED RETIRED Bean Bear 6/27/87 Alpine Valley. Condition is New. Shipped with USPS First Class Package. TOUCAN SAM TONY THE TIGER & DIG 'EM FROG BEAN BAG BREAKFAST BUNCH. Dig 'Em(5"), born 1972, to represent (Sugar) Smacks, whose ad said "The little frog with the big voice!". Tony the Tiger(4"), born 1952, to represent Frosted Flakes with his (They're) Gre-e-eat!". CHECK OUT THE PHOTO!Excellent condition smoke, and pet free as always. Check them out every week! Very good and clean condition. Smoke free home. Pre-owned. See photos. Original set of 11 bears from 1997. Condition: Clean and nice. Cosmic Charlie. GRATEFUL DEAD LIQUID BLUE PLUSH BEAR "Butterfly" DOB: 04/05/93STEVEN SMITH. Condition is Used. Shipped with USPS First Class Package (2 to 3 business days). GRATEFUL DEAD BEAN BEAR BIGBOSS MAN TOUR MEMORY 1966 WITH TAG. Bear is 7" tall and is in beautiful condition - sparkles are really nice. Never played with. Taken out of storage container to take photo of it. 10 bears plus collector's card. 1998 Second Edition Entire Set. This bear was purchased and then stored in a box for many years with other bears. Minor fuzz collection from the other bears, which I mostly brushed off. Looks great! New Plush Dark Star Grateful Dead Bean Bear. Check out our other bears. We've been together ever since. I've heard of high school sweethearts but we're Deadhead sweethearts and I wouldn't want it any other way. 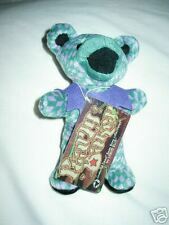 7" Collectible Grateful Dead Tour Memory Bear by Liquid Blue. This was bought, then stored in box for YEARS. It looks very good, though it has collected some dust, fuzz and debris from being in a box with other bears. The fuzzy long hair seems to trap debris in it much easier than the usual short haired bears, and I had to pick some flecks out of his fur. Name tag looks great. The white has a darker, yellowish cast and at first I thought it was from dirt. After looking at pictures online however, this appears to be the way it was made. Hard to find. The plush doll has vibrant yellow, green, and red colors. 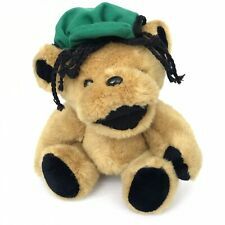 This stuffed animal was made in 1998. The plush doll has vibrant purple and green colors. This stuffed animal was made in 1998. Check out our other bears. It was VERY cool! 7” tall Grateful Dead Irie Bear. See our other Grateful Dead Bears. Is long retired, very desirable. NWT GRATEFUL DEAD BEANIE BEAR. Just perfect for your collection or give as a gift. EXCELLENT CONDITION.WOULD MAKE GREAT GIFT/PRESENT. TAKE A L@@K. NO RESERVE. ~ MUST SEE ~. 1st edition Grateful Dead Beanie Bear Collectible by Steven Smith. Check out our other bears. There are 3 of these Tie Dye Bears and each one has unique colors. Amp in hand, I turned to see the Fat Man himself. 8 bears and 1 turtle plus collector's card. 2001 Seventh Edition Entire Set. Grateful Dead 7" Retired Bear: Dupree 2nd Gen.
Dupree was of the 2nd Generation Grateful Dead Bears and has been long retired. Crazy Fingers has been in storage since 2011. He is in excellent shape. He card has a bend/crease. You can see it in the pictures. I take care of my elderly Mother. All pictures are all actual pictures of the item listed. CHECK OUT THE PHOTO!Nice condition, and smoke free as always. Have had these in storage for years. Makes a nice addition to your Grateful Dead Bean Bag Bears collection. Check them out every week!